ICM are at it again. We have come up with yet another exciting promo slated for this month of May. 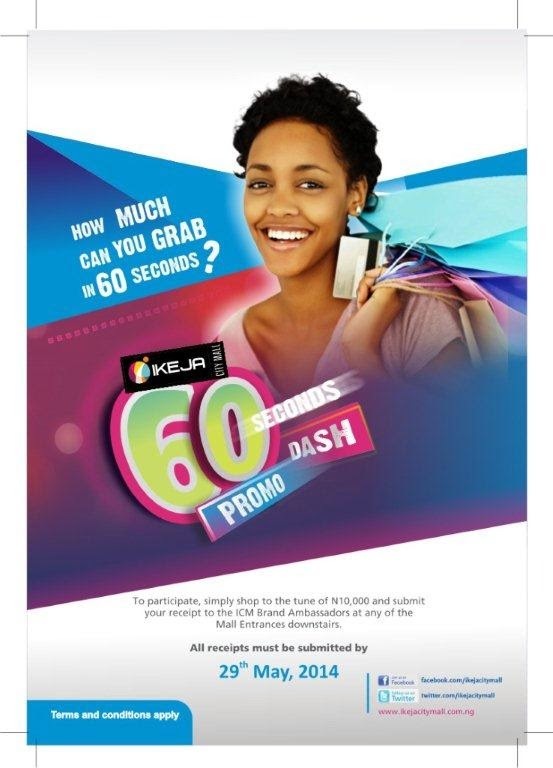 The "60 Seconds Mad Dash" promo is yet another way ICM looks to reward loyal shoppers that patronize our stores. It entails shoppers spending a required sum of N10,000 on a single purchase receipt to qualify for a raffle draw, then dropping their receipts with names and contact details written at the back it on the drop boxes positioned at the three entrances to the mall. The 60 seconds Mad Dash event itself will take place on Friday May 30th. After the raffle draw, winners will be given 60 seconds to dash into any participating stores and pick items worth N10,000. If after tabulations, the items are over N10,000, the shopper will have to return some of the items or add more money to complete the purchase.So get yourself in shape before the promo to make that dash to your favorite store and shop.Ten lucky winners will emerge from the raffle draw. We are using this medium to inform you our valued shoppers that the period for collating receipts will start on Monday May 19th to Wednesday 28th. You are more than welcome to be a part of the event by shopping at ICM stores, telling family and friends about this promo. The more receipts you drop into the boxes, the higher your chances of being one of the lucky winners. To raise awareness for this promo, A-Boards will be deployed at all entrances to the mall and fliers will be in circulation at the start of the new week (Monday 19th, 2014). Brand Ambassadors will be present at all the 3 entrances to the mall to complement the awareness campaign as they enlighten shoppers about the event. Traditional media coupled with social media channels will also be deployed. Since its inception, ICM has consistently rewarded shoppers for shopping at our stores and will continue to do so. This year alone, over 20 people have been rewarded with cash prizes and gifts over the Valentine and Easter period. You can have a look at our Facebook page to see previous events we have organized for loyal shoppers. Follow us on facebook.com/ikejacitymall and on twitter.com/ikejacitymall for updates on promos, events and other news about Ikeja City Mall. Keep shopping at ICM, your choice destination for leisure, entertainment and shopping. Nice promo. Thumbs up guys!